Who doesn't love a magazine freebie? They're a great way to try out new products aren't they? I think the selection this month were bloody fab, although I didn't pick up the mag with the choice of Benefit brow products, I will see though if I can still get my mitts on one. Mind you, now got so much reading to catch up on!!! 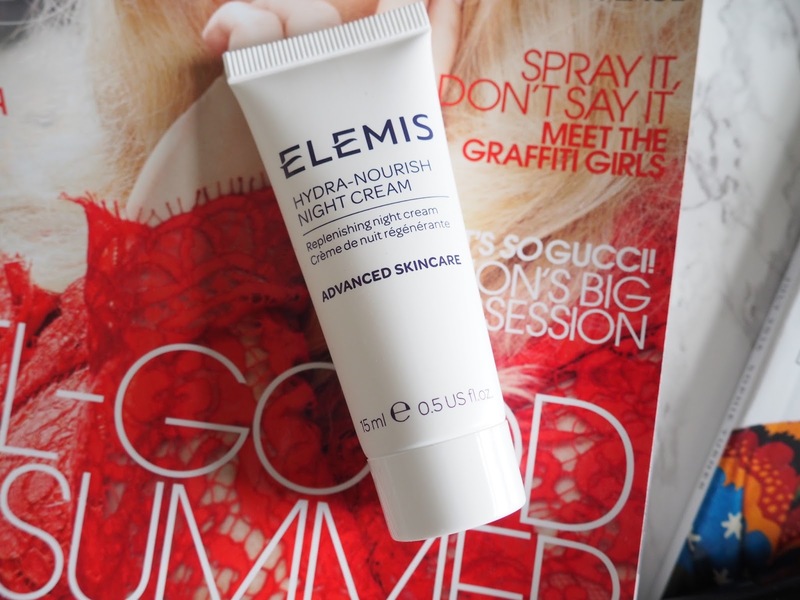 Marie Claire were offering the Elemis hydra-nourish day or night cream in a 15ml sample tube. I knew I wanted to try the night time option as I'm currently out of a night cream. I use a serum at night but still find I want a little something more on top. Being a big Elemis fan I wanted to try this one. It's an antioxidant rich cream which helps to prevent moisture loss and works to nourish and de-stress tired skin. Jeez my skin is beyond tired, and most likely beyond help, but you gotta try haven't you? The cream is fairly thick in consistency but goes on well, although it does absorb rather quickly. You only need a pea sized amount, as with all of the Elemis range a little goes a long way. It has a combination of geranium, ylang lang and hyaluronic acid and smells nice. I'm certainly enjoying using it and my skin feels hydrated in the morning that's for sure. Big thumbs up for this one and a fab idea to give it as a free sample so you don't fork out and then not like it. BIG TIP: Go and buy two or three of the mags if still available and then you'll have 45ml stashed away. The regular 50ml size will knock you back £43 so it's a no brainer. What are you waiting for? Moving on to In Style mag with their offering of a free Eyeko product. You could actually choose between a few different ones and I opted for the FAT liquid eyeliner. 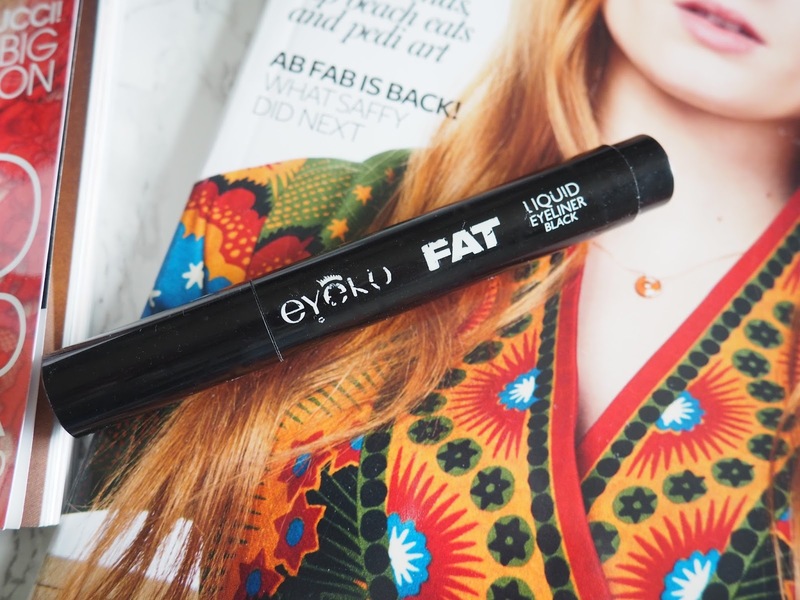 I had a free Eyeko liner in a mag last year and really liked it so I'm glad they've done it again this year and the timing couldn't have been better. When I was in Spain earlier this year I picked up a new eyeliner from Kiko. A chunky one as I don't like those thin pens where you NEVER get a smooth straight line, I like mine fat, as with a fat sturdy end I get a good strong line, well, that I'm happy with 80% of the time anyway! To cut along story short, I don't like the Kiko one but was using it as I had noting else. Until I spotted this one for FREE. This eyeliner is fab. It's so easy to apply which is handy for an eyeliner numpty like me. It's comfortable to hold and glides on effortlessly with no dragging on the eyelid. It's carbon black and has great staying power. This one I WILL be buying again. If you like the look of these and you're quick, you may still be able to get your hands on them. Did you get any of the magazine freebies this months? Thoughts?